• Do you have a difficult time saying “no” even when you know you should? • Are you frustrated because you are so busy attending to the wants, needs, and desires of others that your own go unfulfilled? 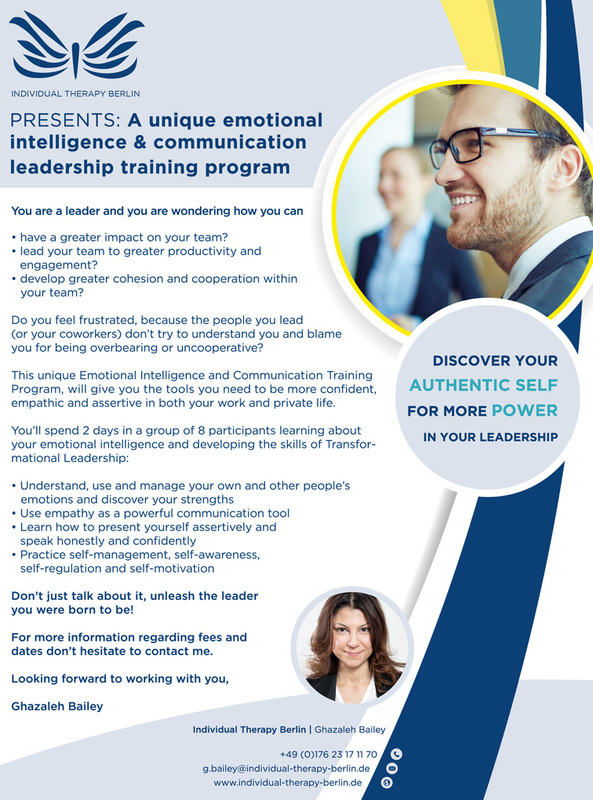 • Are you as assertive as you could be to maximise your self-confidence, and build career enhancing relationships? To ensure effective participation from all participants the workshop has a capacity of maximum 12 participants. Ghazaleh Bailey is Systemic Therapist and Coach with experience in the area of personality development, career, life and business coaching. She works as an Individual and Couples Therapist with a multi-cultural focus for the international community in Berlin. Have you ever asked yourself how YOU can be a courageous, empathetic leader? Then this innovative workshop can be your answer! This workshop allows participants to understand and explore how valuable courage and empathy are to truly suceed in business and relationships. Let’s get together and create a workplace that attracts and keeps the best and the brightest employees and clients! The How to Talk to Men workshop will give you the communication tools to build vibrant connections with the men in your life. You will learn to open the heart of your mate, win the trust of your business associates, and protect the aliveness of your sons.